Bufftech Galveston Victorian Vinyl Posts | Hoover Fence Co. These posts have prerouted holes to accept Galveston with Victorian Accent. Available in White and Almond. 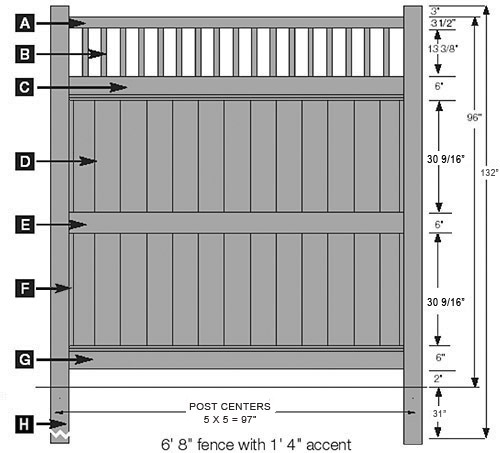 Accent Pickets (B): 17 pieces of 7/8" x 1-1/2 x 17-3/4"
Top Rail (C): 2" x 6" x 95" Classic Curve Deco Rail Ribbed, extruded with channel to accept pickets, includes steel reinforcement. Pickets (D): 26 pieces of 7/8" x 7" x 33-1/2"
Mid Rail (E): 2" x 6" x 95" Ribbed Channeled to accept pickets. Includes steel reinforcement. Bottom Rail (G): 2" x 6" x 95" Classic Curve Deco Rail Ribbed, extruded with channel to accept pickets, includes steel reinforcement. Post (in-ground) (H): 5" x 5" x 132"
Steel reinforcement: Yes, channel located in all rails. Post Spacing (center to center): 97"